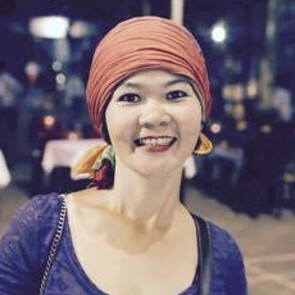 In May 2017, a group of five men violently attacked environmental rights defender Le My Hanh at her friend’s house in Ho Chi Minh City, Vietnam. The men are believed to be government loyalists, and the attack appeared to be in retribution for her reporting. Le My Hanh has reported on peaceful demonstrations by central coast residents eeking compensation for environmental damage caused by a toxic waste spill; the Taiwanese Formosa steel plant in the central coastal waters irreversibly harmed their land and livelihoods. Defending the right to water has become a dangerous activity in Vietnam. In February, defender and blogger Hoang Duc Binh received a 14-year prison sentence for covering the Formosa environmental disaster, its impact on local populations and protests against the company. Globally, HRDs who document the pollution and misuse of water resources face criminalisation, harassment, smear campaigns, and physical attack, including killing, for defending the rights of their communities to access to clean, safe and accessible water. Women human rights defenders (WHRDs) in particular are being impacted by the increase in violence against those speaking out in opposition to the environmental devastation and social violations being wrought by extractive industries. While women are often the backbone and visionaries of movements to protect the rights of people and planet — they are also challenged with an additional burden of risks and dangers as compared to their male counterparts — as they experience the intersection of ecological destruction and cultural displacement, as well as sexual violence and gender-based persecution (read an interview with Front Line Defenders here). The right to water was recognized as a human right by the UN General Assembly (Resolution 64/292) in 2010, acknowledging that clean drinking water and sanitation are essential to the realisation of all human rights. The right to water must be accessible to all through policies and practices based on participation, transparency, accountability and non-discrimination. Even projects that aim to protect water resources can create community problems and introduce threats to HRDs. In January 2018, the European Union suspended funding for a water development project in Kenya after one member of the local Sengwer community was murdered, several others were shot, and HRDs reported ongoing attacks against them. The EU-funded programme, the Water Towers Protection and Climate Change Mitigation and Adaptation Programme, sought to protect the ground supplies of water, which are known as water towers, in the Mount Elgon and the Cherangani Hills areas of Kenya. The water towers store rainwater, enable regular river flows, recharge ground-water storage, improve soil fertility, reduce erosion and sediment in river water, and host a diverse species of plants and animals. Guards employed by the Kenya Forestry Services, however, started forcibly evicting Sengwer people supposedly in the name of conservation, and setting fire to their homes to stop them from coming back. The EU insists that conservation work on the water towers was never expected to involve any evictions or use of violence. helping HRDs at risk with financial resources, or assisting affected communities and organisations with projects that aim at resolving issues or addressing violations. 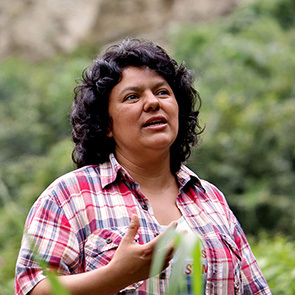 (1) Entrevista inédita a Berta Cáceres: "Somos muy vulnerables. No podemos confiar ni en la policía"
(2) The EU, before it implements projects, in the identification phase, has to carry out impact assessments to anticipate possible problems. These should fully include assessments on the likely impact they could have on HR (eg creation of discrimination by helping some communities and not others, reinforcing inequalities etc; and for HRDs, eg have similar projects resulted in violations within the country or in similar circumstances etc). Emma Achilli is Head of the European Union Office in Brussels, and has 20 years of experience of working with the EU. She joined Front Line Defenders after 10 years of working in human rights in EU institutions, and before that in development cooperation.